Ralph Bakshi's animated adaptation of the J.R.R. Tolkien classic is now under $10 at Amazon! 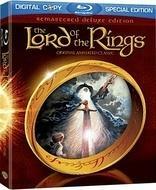 The online retailer is selling 'The Lord of the Rings (1978)' for $9.99 (50% off suggested price). Click here to form your own fellowship of savings today!